As predicted by yours truly a few hours ago, O2 will be the exclusive network of the Palm Pre. 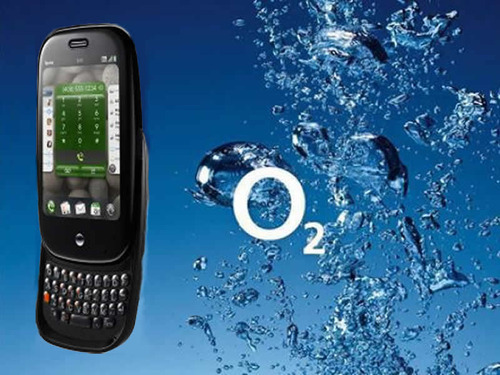 O2 reportedly beat off competition from Orange – just as it did when it scored the exclusive rights to the iPhone back in 2007. O2 is already the market leader in the UK with a share of 27%. By stocking the Pre alongside the iPhone 3GS their lead will surely increase further. Nothing has been confirmed by O2 officially and there are no price details as of yet either. You can’t imagine Apple would be too thrilled if the Palm Pre was a more affordable option than the iPhone 3GS though. I fully expect the pricing to be an exact match of the 3GS in terms of plans, although the handset itself might be a smidgen cheaper as it is in the US. LG watch-phone to cost £1,000!? Gosh, that’s rather a lot. Mobile Today reckons that the LG watch phone that we covered here will be exclusive to Orange and cost a massive £1,000. Wow. 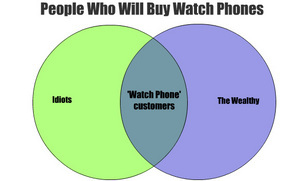 The mere thought inspired Nate Lanxon from CNET to create the wonderous venn diagram over the the right there. The G910 watch-phone was announced at MWC last week, and LG showed it off at CES too. Considering its appalling specs, requirement that you constantly wear a headset, and – now – massive price tag, it’s clear that Orange see this as a novelty for rich people, not a real device. 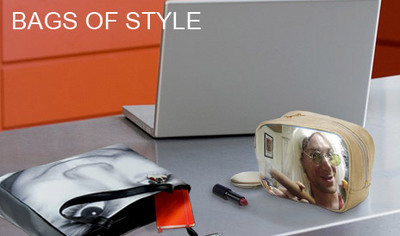 Try out Photobox Super Photos exclusively on Tech Digest! EXCLUSIVE: Canon engineers held back by marketing department&apos;s "megapixel race"
Canon engineers are being held back from developing new sensor technology by marketing departments in a “race for megapixels”, claims an employee of the Japanese photography company. Uh-oh. Set the internet to RED ALERT – the nasty HD DVD and Blu-ray war might just be about to end, thanks to Hollywood heavyweight Warner deciding to go Blu-ray exclusive in 2008. 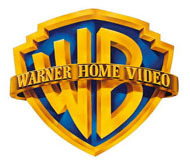 In a press release over on its official portal, Warner Bros. has kicked all HD DVD owners to the kerb – and announced it’s going Blu-ray exclusive from May of 2008. I remember a time, growing up in the 1980s, when there was real anticipation for what the BBC and ITV would pull out of the hat for the post-Queen’s Speech Christmas premiere or blockbuster. In an age where video recorders had only just arrived, there were barely four terrestrial channels, and you had little choice but to watch the broadcasters’ choice, this worked quite well. As video recorders took hold, I began to think that the channel wars were just a tad pathetic. After all, if you really wanted to watch two programmes that clashed, you just recorded one of them and played it back later. 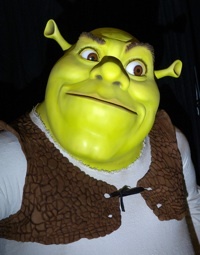 I suppose broadcasters bank on the likelihood that most people will be stuffed and near-comatosed by 3pm on Christmas Day, but really, good though Finding Nemo and Shrek 2 are, they don’t feel like exclusives any more.